Many of you know how difficult reducing your gluten intake or going completely gluten-free can be, and finding a healthy substitute is challenging. Years ago, when I began sourcing out alternatives for wheat, I realised that so many gluten-free products were not the healthiest of options. Most were, and still are, loaded with sugar, chemical flavour enhancers, and chemical binding agents to make them palatable and flexible. Through trial and error, I've been able to create healthy substitutes using ingredients such as gram flour (aka chickpea flour), rice flour, tapioca starch and corn meal. Garlic, turmeric, dried herbs, cumin seeds, and other seasonings can be added to compliment the filling of choice. Asian Rice paper wraps (made only with rice and water) are another gluten-free option. 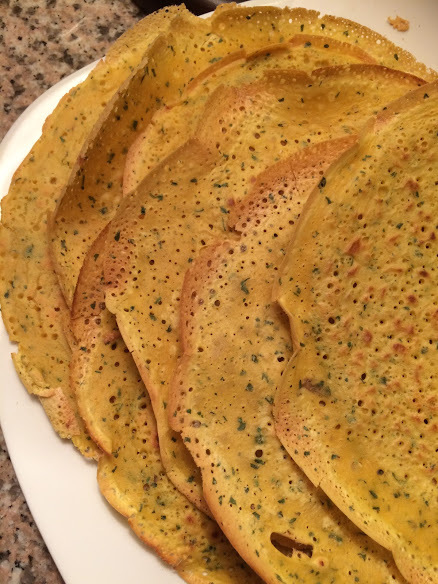 I hope you will try my gluten-free Socca Crepe recipe!